Dixie came to Livingston County Humane Society in Pontiac, IL, as a stray, so she had to be kept at the shelter for a required number of days to make sure her people didn’t claim her. She had already been spayed, so there was evidence that she’d had people at one time, that she wasn’t always homeless. For her, it was a waiting game. 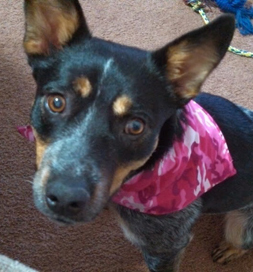 Would someone claim this Australian Cattle Dog mix? True to her breed, Dixie keeps a watchful eye on what’s going on. The shelter staff at Livingston County Humane Society impressed J. He had such a positive experience he hopes others will give adoption a try and that they find a pet that steals their hearts the way Dixie has stolen his.